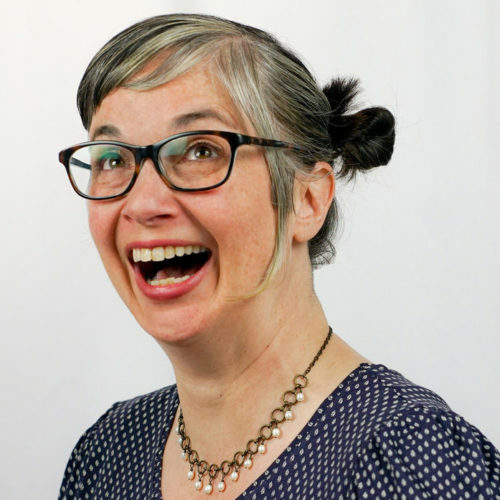 Jill Bernard has been performing with ComedySportz-Twin Cities since 1993, and is a founding member of HUGE Theater in Minneapolis. She is one-half of the duo SCRAM with Joe Bill of the Annoyance Theater. An Artistic Associate of the Chicago Improv Festival, she has studied at the Annoyance Theater, Improv Olympic, the Brave New Workshop and other organizations; and is the recipient of the 2005 Chicago Improv Festival Avery Schreiber Ambassador of Improv Award, and the 2007 Miami Improv Festival award for Best Solo Show. "This workshop presents Jill Bernard's Fireball Theory and offers exercises to help you improvise faster and harder than you can judge yourself. You will learn to metaphorically hit the scene running and outrun the explosion of self-loathing and doubt like an action movie hero outruns a fireball thus defying the laws of physics. Please wear closed toe shoes to this workshop. "Jill Bernard offers a character toolkit to give participants the ability to create strong, compelling characters that they can hang onto through the whole scene. This session will focus on using Voice, Attitude or Posture, and Animal, Prop or Obsession to build instant characters. Participants will use these tools to fearlessly initiate scenes, create relationships and find agreement. But improv can also contain realistic characters who are vulnerable. Having the ability to create improv that is honest and vulnerable adds another layer to your work, a little bit of cake underneath your frosting to take your work from light entertainment to something with resonance. In this module, we start with your true self as a completely valid and powerful launchpad to creating original improvisation." Sign up to our newsletters ! Lyon Improv Fest 2019 ? Stay tune ! We make a commitment to keep your data in complete safety for a duration of three years and to update them permanently according to the rules of the new general data protection regulation (GDPR) coming into effect in the European Union on May 25th, 2018. These data will be for exclusive destination of Improvidence and will be never passed on, sold or will leave with consultation of others. Random is an improv show in its purest form. It is a playground for improvisers and an open window to their imagination. Scene after scene, actors and musicians create worlds using might, music, sound or random set pieces. With Selena Hernandez. Episode 8 with Joe Bill. A season of 9 episodes about love cynicism, emotional or sexual addiction, the highs and lows of meeting someone… quests to find our unreachable stars. People remember things, things remember people. All the time, all the times. A show by Omar Galvan. No relationships go deeper than family relations. (Grand)parents, children, siblings, they can often read each other even if they don’t want to be read, and they constantly rub each other either the right or the wrong way. Love and hate sleep in the same bed. That is why most drama, both in theater and in real life, is family drama. Inspired by true personal stories of the actors and the audience, we will play an impactful collage of scenes in diverse theatrical styles. Sometimes we will find the obvious, sometimes a hidden gem. Raw, hilarious, dramatic – but always fierce. Trapped by a evil game, Storybox’s actors/singers and musicians must act, sing, dance and improvise to survive-all based ont the audience’s suggestions. Come and see short musicals that will let you travel through music and theater. Inbal Lori (Tel Aviv) and Tim Orr (San Francisco) combine to present Click. In this format, the improvisers take their inspiration from photographs provided by the audience, rather than verbal suggestions. Each scene will start with a new photograph, and the scenes are most likely unrelated. The evocative, non-literal nature of photographs allows the actors to discover their way into characters and situations through the feeling that the images inspire. 20 suggestions are taken from the audience in perfectly random order and written on a board visible only to the audience. Improviser and mentalist Cédric Fernandez memorizes these words. His partner then enters the theater knowing nothing of these words, and from there they embark on an improvised story in which Cédric puts the words in order from 1 to 20. A show by Mark Jane and Jeanne Chartier. The life of an object told through the stories of the people who encounter it. A show by Felipe Ortiz and Patti Stiles. Two mediterranean woman, one a brunette Israeli and the other a blonde Spaniard, will improvise a full-length story as an allegory based on a secret answer they get from someone in the audience. Be prepared for anything: beauty, ugliness, love, hate, violence, dance, and the art of not giving a f**K.
This is a show without rules or structure. it is about the story they both wanna tell you at that exact moment. Corpus Gang is a spontaneous, visual and musical comedy! Helped by the musicians, the actors give life to the audience words, using only their bodies to create funny or poetic characters and their intertwined stories. Life is like hitting random on a playlist, you never know what song is coming next. “Dance, Monkey!” is an improvised one-woman show with an ever-emerging cast of thousands of characters. Music inspires dance, movement, personalities, points of view, location, time, tone and pace as one scene moves to the next. “Dance, Monkey!” is comedic monologues and scenes just like a solo theatre piece, except everything is made up on the spot and the characters are talking right to you! A show performed by Lindsay Gonzales. The company Le Mal du Siècle invites you to a party from which no one will emerge unscathed. A hotel clerk’s first night shift. Four rooms calling for service, one after the other, and the page boy soon realizes: It’s no ordinary night! Funny, spooky or deeply touching: an improvised journey bringing you four rooms with four stories. A show directed by Lee White. One word, a short discussion, then one story, a weirdly specific world and characters who fight to change against all odds. A mix of character-driven storytelling, visual worldbuilding and complete absurdity makes Hugh & Olivier a truely unique duo. The trick: the four suspects know who is guilty but not the detectives beforehand. This musical from Joe Samuel (UK), Heather Urquart (UK) & Joe Bill (USA) is based on the idea that the favorite songs in Improvised Musicals tend to be those songs that are rooted in the Blues. They wondered, what if EVERY song in a musical was a completely different sounding song that’s rooted in The Blues? Would that even be possible? After a wildly successful debut in 2017 at The Arabian Nights Festival in Dubai, it became clear that it was not only possible but that THIS is the trio who can wield the musical Blues Hammer to cure whatever blues their audience might be experiencing that night. This talented & experienced trio, led by the phenomenal musical improviser Joe Samuel on keyboards, is happy to share Blues Hammer with LIF this year. A poetic exploration on the daily life of a nonexistent but probable small town. Omar Galvan and Felipe Ortiz will take you on a journey through the world of latin American magic realism: characters, places and situations from a town lost in time and space. Infinite possibilities open up in front of our eyes when two clowns take the stage and improvise. Imaginary worlds are born, inspired by the audience, connecting us all… like strings. Björn Bongaards and Donat Feijóo’s duo format «Lock & Load» takes you to the improvised world of the Secret Service: fast cars, thundering explosions, loaded handguns, lots of action and an evil villain who tries to get into the heros way at the critical moment. After all, someone’s got to save the world! «Lock & Load» is a narrative longform show inspired by James Bond-style movies. Take Israeli born Inbal Lori, add the Canadian improv hero Lee White. They blend together to become one of Berlins hottest new duos. The Lorilees. They approach stories in a way that’s beautiful and edgy. Never afraid to shy away from hard topics, their improv styles mash together with power and grace. SCRAM! is a show by Joe Bill and Jill Bernard where 3 different 2-person scenes happen at the same time. Want to laugh while learning something about science, then this is for you! Five women are spending time together in one place. Each of them has a secret. Over the course of the short three-act-play some of the secrets will come to light – and will forever change the relationships between the women. fantasy led by charismatic storytelling. A show created by Inbal Lori (ISR-Berlin) and Keng-Sam Chane Chick Te (Reunion Island) and performed by the full festival ensemble. In this course we will learn how to use the body as well as the mind. Not to be dissociated to be able to transmit in silence with our bodies the things that are happening to us. We will learn to gather ideas with physicality and body, in order to achieve a more complete and committed communication. We will see the different ways we have to tell a story. Using resources like flash-back, flash-forward, music to make time jumps. Even cyclic structures, ordered and disordered. We will learn to know what is the main thread of each story and to quickly identify which is the engine and the idea. So we don’t get lost later in the structure and use it to entertain us and to surprise the audience. A one day course for people who have said ‘I could never do musical improv’. Heather and Joe will provide a supportive, joyous and safe environment for any age or ability to explore the world of improvising with music. We’ll cover a range of music styles, games and song structures. We’ll also look at taking improvised scenes into songs. Really useful for those who want to give it a go but need a safe environment to let their musical hair down. Also suitable for those who want a fun refresh and introduction to some new exercises. In this workshop you will work on scenes that lead to memorable songs, and practice different song structures. What makes a scene go from talking to singing? When is it the right moment? How can a song rise the stakes or make us understand a character? You will find answers to these questions and many more! And this class is open to musician improvisers! In this workshop, I take participants through some of the core principles of Commedia Del Arte. On how through your body language, and gibberish you can actually tell a story. How can I perform without talking my native language? How a movement or a facial expression can transform your story? How do we elaborate a scene without talking, but only with your body expression? This workshop is an encounter with an essential part of oneself. The clown that we’re looking for is hidden there where we hide our defects and our fears. Where we hide optimism and the pleasure to fail as well. In the workshop we´ll explore through games, improvisation and movement, the work of connecting in a special way with the public, the discovery of creativity immersed in failure, the ability to live in the moment and the moment in search of pleasure and play. Lee will guide you through some basic long form structures to give you a taste of the complicated but exhilarating world of long form improv. This workshop covers story timing, simple story frameworks and character development. Even if you have been doing long forms for years, this is a great workshop to get new perspectives and inspiration. Magical Realism is a genre where extraordinary, unreal and strange things appear as part of the daily life and it´s completely normal. This workshop is a journey through the complex world of magical realism exploring basic elements such as : different ways of playing with time, fantastic or magic things as part of normal life, social and political relationships, and from who´s point of view are we watching the story. Just like life – impro requires contradictory abilities: the ability to be focused, and the ability to let go. To zoom in and zoom out. To find the details and tell the story. To lead! And still stay surprised. To hurry up, and slow down. These contradictory abilities are simply different ends of the same rope. The rope of focus, storytelling, cooperation, rhythm and more. I invite you to come and explore the balance, the place where you can choose to do what’s needed at the right time. Be a Ninja! You have inside of you the spectrum of each tool, now use the one most needed. The workshop will explore the joy of finding truth in characters, and the ability to change in a believable way. We will do so by trying out different body languages, statuses, personal rhythms and psychological states. We will explore realistic characters along side with expressive and extreme ones. By using impro scenes and long forms, we will search the ways each character has to express it self while using its motivation, action, relationships and more. This workshop will probably be best for Intermediate to Advanced Improvisers and especially beneficial for multilingual improvisers. I will also provide personal feedback for each improviser and will be open to addressing any curiosities about Language in Improvisation that students bring into the workshop. This workshop will explore more than 15 structures for one actor scenes. Using viewpoints and other tools we will unfold the triple role in the monologues: the writer, performer and director. Tools to generate scenes and no improv text. Let’s take risks. Let’s be on the stage in groups of between 3 and 10 people at the same time. Let’s see how we can find focus, harmony, beauty, narrative, statuses and much more in this situation that we are usually trying to avoid. I believe that seeing a bunch of improvisers finding the flow together is a powerful and unusual thing to see on an impro stage. I invite you to explore with me the power of a group. To find the difference notes in the harmony. To find the balance between leading and following. To enjoy the power and support of being on stage as a mass group. The sound painting is a sign language that is used to compose in real time performances executed by several art disciplines. Created by Walter Thompson and spread around the world, the “Impro Big Band” is a derived dialect from the original. The end of the workshop is a performance open to spectators. It has been performed at Mexico, Reunion Island, Puerto Rico, Spain, etc. with an absolute success. Is a new way to play, in relationship with another artistic disciplines. This workshop is open to actors, musicians, dancers and any other artistic discipline! Jill Bernard offers a character toolkit to give participants the ability to create strong, compelling characters that they can hang onto through the whole scene. This session will focus on using Voice, Attitude or Posture, and Animal, Prop or Obsession to build instant characters. Participants will use these tools to fearlessly initiate scenes, create relationships and find agreement. But improv can also contain realistic characters who are vulnerable. Having the ability to create improv that is honest and vulnerable adds another layer to your work, a little bit of cake underneath your frosting to take your work from light entertainment to something with resonance. In this module, we start with your true self as a completely valid and powerful launchpad to creating original improvisation. This workshop presents Jill Bernard’s Fireball Theory and offers exercises to help you improvise faster and harder than you can judge yourself. You will learn to metaphorically hit the scene running and outrun the explosion of self-loathing and doubt like an action movie hero outruns a fireball thus defying the laws of physics. This Master Class is designed for the experienced improviser and is focused on providing specific feedback on the individual from an experience outside eye. We look at strengths, patterns and habits. The aim is to bring a greater awareness of your work, provided challenges and open areas for growth. Deal with the worst improvisers and worst situations. Improvising implies taking risks but also commitment to your partners. We want to feel safe on stage but that oftens makes us too polite. We’ll study both sides of the coin and learn how to break the rules and deal with the rulebreakers! The intensive focuses on the skills for creating, building and sustaining a scene / story in either long or short form. We look at platform, circle of expectations, identifying whose scene is it, advancing, raising the stakes and finding endings. This workshops aims at giving you a comprehensive toolkit to explore, enjoy and design your own sound signature. We’ll go through basic beatboxing and musical notions to support scenes with powerful soundtrack. No need to be a specialist, just explore your possibilities and create your own sound box, special effects, animate,objects, animals and more! Discover the joys of using your full acting prowess in this awesome format! If you enjoy improvising full-length stories, you’ll LOVE discovering The Naked Stage! This intensive will focus on the acclaimed Improv Playhouse of San Francisco format “The Naked Stage”, in which the stories take place in a single setting/location, in traditional stage-play style. The improvisers play one character each, and there are no built-in time jumps, transitions or scene breaks. All the actors have is the bare stage, a simple suggestion from the audience, and each other. “The Naked Stage” is hugely popular in San Francisco and across the USA. “The Naked Stage” combines San Francisco’s tradition of narrative longform improvisation with the demands and surprises of traditional theater. In a sense, the actors are “trapped” on stage with only each other. Without the usual exit options (lights, time and location jumps, and other scene-enders), they are left to fully confront the characters and situations which they have created. How do we do it with clarity and commitment? How do scenes build? We need to pay attention and respond to each other in new and exciting ways. Fun! This workshop is for those who want to start working with the audience even more than already usual in improv. You may have heard of Lees work on stage, performing scenes with audience members in the show „Your 15 Minutes of Fame“. The results can be magical. It’s a must see for any Improviser. Working with the audience can be tricky, dangerous and even frightening. Lees approach is simple… they should be the star. Giving everything to support your public partner becomes the best practice for any improviser. Lee takes you through his philosophy and various scenarios to condition you for entering the world of scenes with audience members. In this workshop we will combine multiple aspects of improvisation to make characters, scenes and stories bigger, stronger and more fun! Physicality: by being physical on stage, we lift improv out of the “talking heads” syndrome and into exciting and theatrical worlds. By being physical, we engage both ourselves and our audience on a visceral level. How do we portray Violence, Friendship, Intimacy, Love, Lust? Staging: in improv, we can actually make an audience see things and places that aren’t there on stage, if only we have the skills and commitment to make it happen. Instead of standing onstage and talking, we have the opportunity and the challenge of portraying the full range of human experience.